A Harvard epidemiologist has been on a crusade to curtail aerosol transmission experiments on avian influenza H5N1 virus because he believes that they are too dangerous and of little value. Recently he has taken his arguments to the Op-Ed pages of the New York Times. While Dr. Lipsitch is certainly entitled to his opinion, his arguments do not support his conclusions. In early 2013 Lipsitch was the subject of a piece in Harvard Magazine about avian influenza H5N1 virus entitled The Deadliest Virus. I have previously criticized this article in which Lipsitch calls for more stringent H5N1 policies. More recently Lipsitch published an opinion in PLoS Medicine in which he called for alternatives to experiments with potential pandemic pathogens. We discussed this piece thoroughly on This Week in Virology #287. The arguments he uses in both cases are similar to those in the OpEd. The Times OpEd is entitled Anthrax? That’s not the real worry. The title is a reference to the possible exposure to anthrax bacteria of workers at the Centers for Disease Control. Even worse than anthrax, argues Lipsitch, would be accidental exposure to a pathogen that could transmit readily among humans. He then argues that such a pathogen is being created in laboratories that study avian influenza H5N1 transmission. Lipsitch tells us ‘These experiments use flu strains like H5N1, which kills up to 60 percent of humans who catch it from birds.’ As an epidemiologist Lipsitch knows that this statement is wrong. The case fatality ratio for avian H5N1 influenza virus in humans is 60% – the number of deaths divided by the cases of human infections that are diagnosed according to WHO criteria. The mortality rate is quite different: it is the number of fatalities divided by the total number of H5N1 infections of humans. For a number of reasons the H5N1 mortality ratio in humans has been a difficult number to determine. Next Lipsitch incorrectly states that the goal of experiments in which avian influenza H5N1 viruses are given the ability to transmit by aerosol among ferrets is ‘to see what gives a flu virus the potential to create a pandemic.’ The goal of these experiments is to identify mechanistically what is needed to make an avian influenza virus transmit among mammals. Transmission of a virus is required for a pandemic, but by no means does it assure one. I do hope that Lipsitch knows better, and is simply trying to scare the readers. He then turns to the experiments of Kawaoka and colleagues who recently reconstructed a 1918-like avian influenza virus and provided it with the ability to transmit by aerosol among ferrets. These experiments are inaccurately described. Lipsitch writes that the reconstructed virus was ‘both contagious and comparably deadly to the 1918 flu that killed tens of millions of people worldwide’. In fact the reconstructed virus is less virulent in ferrets than the 1918 H1N1 virus that infected humans. In the same sentence Lipsitch mixes virulence in ferrets with virulence in humans – something even my virology students know is wrong. Then he writes that ‘Unlike experiments with anthrax, creating such flu strains in the lab presents a danger that affects us all, because once it is out, such a strain would be extremely hard to control.’ This is not true for the 1918-like avian influenza virus assembled by the Kawaoka lab: it was shown that antibodies to the 2009 pandemic H1N1 influenza virus can block its replication. The current influenza virus vaccine contains a 2009 H1N1 component that would protect against the 1918-like avian influenza virus. The crux of the problem seems to be that Lipsitch does not understand the purpose of influenza virus transmission experiments. He writes that ‘The virologists conducting these experiments say that by learning about how flu transmits in ferrets, we will be able to develop better vaccines and spot dangerous strains in birds before they become pandemic threats.’ This justification for the work is wrong. Both Kawaoka and Fouchier have suggested that identifying mutations that improve aerosol transmission of avian influenza viruses in ferrets might help to detect strains with transmission potential, and help vaccine manufacture. I think it was an error to focus on these potential benefits because it detracted from the real value of the work, to provide mechanistic information on what allows aerosol transmission of influenza viruses among mammals. In the Kawaoka and Fouchier studies, it was found that adaptation of H5N1 influenza virus from avian to mammalian receptors lead to a decrease in the stability of the viral HA glycoprotein. This property had to be reversed in order for these viruses to transmit by aerosol among ferrets. Similar stabilization of the HA protein was observed when the reconstructed 1918-like avian influenza virus was adapted to aerosol transmission among ferrets. It is not simply coincidence when three independent studies come up with the same outcome: clearly HA stability is important for aerosol transmission among mammals. This is one property to look for in circulating H5N1 strains, not simply amino acid changes. Lipsitch mentions nothing about the mechanism of transmission; he focuses on identifying mutations for surveillance and vaccine development. He ignores the fundamental importance of this work. In this context, the work has tremendous value. The remainder of the Times OpEd reminds us how often accidents occur in high security biological labortories. There are problems with these arguments. Lipsitch cites the emergence of an H1N1 influenza virus in 1977 as ‘escaped from a lab in China or the Soviet Union’. While is seems clear that the 1977 H1N1 virus probably came from a laboratory, there is zero evidence that it was a laboratory accident. It is equally likely that the virus was part of a clinical trial in which it was deliberately administered to humans. Lipsitch also cites the numerous incidents that occur in American laboratories involving select agents. I suggest the reader listen to Ron Fouchier explain on TWiV #291 how a computer crash must be recorded as an incident in high biosecurity laboratories, but does not lead to the release of infectious agents. Lipsitch clearly feels that the benefits of aerosol transmission research do not justify the risks involved. I agree that the experiments do have some risk, but it is not as clear cut as Lipsitch would suggest. Although ferrets are a good model for influenza virus pathogenesis, like any animal model, they are not predictive of what occurs in humans. 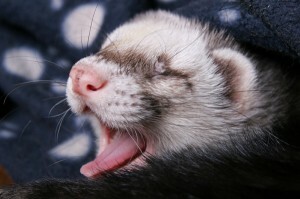 An influenza virus that transmits by aerosol among ferrets cannot be assumed to transmit in the same way among humans. This is the assumption made by Lipsitch, and it is wrong. I agree that transmission work on avian H5N1 influenza virus must be done under the proper containment. Before these experiments can be done they are subject to extensive review of the proposed containment and mitigation procedures. There is no justification for the additional regulation proposed by Lipsitch. In my opinion aerosol transmission experiments on avian influenza viruses are well worth the risk. We know nothing about what controls aerosol transmission of viruses. The way to obtain this information is to take a virus that does not transmit by aerosol, derive a transmissible version, and determine why the virus has this new property. To conclude that such experiments are not worth the risk not only ignores the importance of understanding transmission, but also fails to acknowledge the unpredictable nature of science. Often the best experimental results are those which were never anticipated. Lipsitch ends by saying that ‘There are dozens of safe research strategies to understand, prevent and treat pandemic flu. Only one strategy — creating virulent, contagious strains — risks inciting such a pandemic.’ Creating a virulent strain is not part of the strategy. Lipsitch conveniently ignores the fact that Fouchier’s H5N1 strain that transmits by aerosol among ferrets is not virulent when transmitted by that route. And of course we do not know if these strains would be transmissible in humans. I am very disappointed that the Times chose to publish this OpEd without checking Lipsitch’s statements. He is certainly entitled to his own opinion, but he is not entitled to his own facts. (I’ve also posted this as a comment on your G+ feed, but just in case, here it is) Neither Lipsitch’s op-ed nor Fouchier’s claims on the recent TWiV were models of scientific rigor. Instead we heard FUD from both sides (Need to learn how to stop the next pandemic! You’ll create it, you sorcerer’s apprentice!). I appreciate the importance of understanding aerosol transmission, but I don’t understand why those studies need to be done with especially virulent strains like 1918 H1N1 or H5N1. As a regular TWiV listener, I’ve heard many of your comments on the importance of basic science, and I agree with them in general, but I feel a lack of concern with the possibility of human error creating a situation that, even if not deadly, will lead to irresistible public demands for closing all virus transmission research. It also worries me that serious evolutionary biologists like Jonathan Eisen oppose the continuation of the work in question http://microbe.net/2014/07/04/not-all-pathogen-research-should-be-done/. I know a bit more biology than the average educated person (10 peer-reviewed bioinformatics papers) and yet I can’t find well-founded arguments on either side. Just curious, if H5N1 is truly so terrible that we shouldn’t conduct research such as this, wouldn’t it be prudent that we mix it into the next few vaccines as a precautionary measure? I just don’t understand the reasoning for their fear otherwise. in poultry and mammals), they are still similar to 1918.
similar to 1918 but with different antigenic profile. and how we can prevent unauthorized experiments in the future. vaccine, even if we could produce large quantities in time. I’m squarely in Dr. Lipsitch’s court on this. There are many instances of pathogen escape from labs….in 1978, Ms. Janet Parker of the UK became the last person to die from smallpox, which had escaped from a lab at the University of Birmingham Medical School due to a mistake in handling. Also, we must not forget the potentially dire consequences of deliberate malfeasance….the late Dr. Bruce C. Ivins sprung the largest bioterrorism outbreak upon US society due to his obsession with a college sorority! Fouchier and Kawaoka are simply academic narcissists, playing with fire. Their research yields no practical knowledge about what mutation might occur in the wild, and Dr. Lipsitch writes elegantly and thoroughly on this topic. nuclear, biological and chemical warfare. response to judge Dr Lipsitch’s presentation. a representative of the public I can’t refute his nor Prof. I think a “Ferrets are not human” would be appropriate here.